C.D.H.A.Q., Sweeney’s notation for "Catherine Drunk Had A Quarrel", appears time and again through the diary in reference to his wife Catherine, an indication of Sweeney’s tumultuous home life. Sweeney himself was a troubled man, he had many “contradictions” with both friends and family and the notation “uneasy in my mind” appears throughout the diary. Peter was the first lockmaster at Jones Falls on the Rideau Canal. He served there from the canal’s opening in 1832, to his retirement in 1872. The diary, which spans the years 1839 to 1850, not only provides a fascinating first hand glimpse into the daily activities at a Rideau lockstation, but also into the social life of this sparsely populated section of Upper Canada. This book contains a transcription of the entire twelve-year span of the diary. In addition, local historian Susan Warren has greatly enhanced our understanding of the diary with her feature article on the Life and Times of Peter Sweeney and a full listing of who’s who in the diary. This book is a project of Friends of the Rideau. 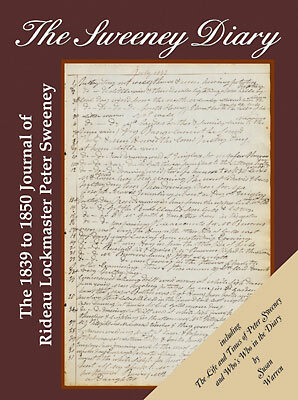 It was undertaken to make this fascinating document, the diary of Lockmaster Peter Sweeney, available to the general public and to provide a long-lasting Rideau legacy. Financing for the printing of this book was provided by the Rideau Legacy Fund, a fund administered by Friends of the Rideau. All the work to get this book to the print-ready stage was done by volunteers who donated their time and their skills in research, writing and book production. Proceeds from sales will go to the Rideau Legacy Fund and to Friends of the Rideau projects. Have just finished reading The Sweeney Diary, a most thorough and fun treatment of one of the best annotations of a diary there must be. You have turned linear jottings into a spherical multi-dimensional treatment, wonderful work, you are to be commended for your dedication -- what DETAIL in aspects such as the biographical listing and the treatment of so many aspects of life around the diary. High-five to ... the Friends of the Rideau for helping make this possible. Truly an addition to the legacy of the canal, in all of its aspects.